Buck Mountain is a moderate hike on the east side of Lake George that features unparalleled views of the lake and mountains. The climb is approximately three miles one-way, and there are a few rocky, challenging sections. Because of this, it is not ideal for young children. Buck Mountain can be hiked from both the north and the south. To ascend from the south, begin at the trailhead on Pilot Knob Road (the same trailhead where you begin the Stewarts Ledge hike). Enter 1750 Pilot Knob Road, Fort Ann, NY or the coordinates 43.509238,-73.631144 into your GPS. This trailhead features signs referencing Buck Mountain, Shelving Rock Road, Sleeping Beauty Mountain, and other destinations. Take the marked Buck Mountain trail, and a couple hundred yards in, continue following the marked trail straight ahead. If you turn right onto the unmarked trail, you'll wind up at Stewarts Ledge. 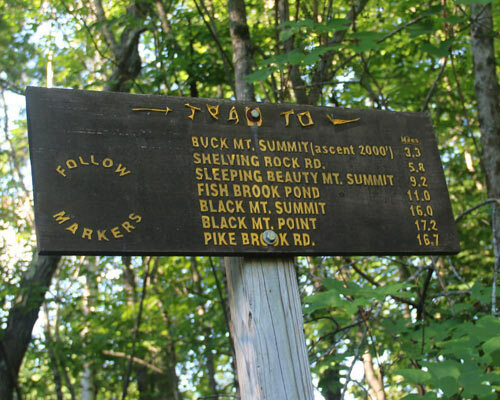 To ascend from the north, begin at the trailhead on Shelving Rock Road (near the Dacy Clearing trailhead for Sleeping Beauty and Fish Brook Pond). There are nine designated parking areas in the Shelving Rock Area, and parking is not allowed on the sides of Shelving Rock Road. Dacy Clearing Road will branch off to the right (trailhead for Sleeping Beauty Mountain), but continue on Shelving Rock Road for a short distance longer, and a marked trailhead for Buck Mountain will be on your left. Buck Mountain is also accessible by boat from Pilot Knob.